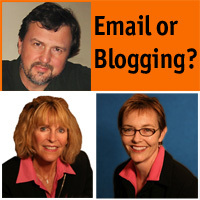 Blogging for your business is not an option anymore, but does it work better that Email Marketing? How do you make the these two marketing strategies work together to create a powerful tool to boost your small business or professional practice? Is blogging an option for any kind of business? How to use blogging to strategically market a business? How to choose which blogging platform to use? What are some of the pitfalls and how to avoid them? I have a web site – why do I need a blog, too? I already have a web site – how do I connect my blog to it? I have an email newsletter – how do I use my blog to generate more subscribers? What is RSS, FeedBurner, FeedBlitz – and do I need to be a tech geek to create and maintain a blog? How do I blog without having a blog of my own? These are a few of the questions Patsi, Denise and I will answer for you. There will be no pitching or selling on the call, just pure content. Seating is limited, so register for your chance to jump start your blogging efforts in 2009, or if you’re already blogging, to find out how to make the most of business blogging to promote your business. I started blogging with Boris’ networking group to get started in the art of blogging. I didn’t expect much of it for a start, but soon after, with only two entries on the blog, I surprisingly got a call from Germany saying they found my blog posts and asking if I could assist them on their Canadian matters. This relationship developed very fast so that we are now working close together. And this due to a few blog entries on a frequently updated Blog. Amazing! I downloaded and listened to the seminar and learned so much about how to start and manage a blog. I currently have a web site being developed for mortgage financing and I can hardly wait to get started. I never realized how much power blogging has. After looking at several blogs and started to realize how much this could help me with my business. Thanks to Boris for such great education about blogging. Follow any responses to this entry through the RSS feed. This is the TrackBack URI to this entry.